Five years after cracking under the pressure of his own hype, piano prodigy Tom Selznick (Elijah Wood) is ready for a comeback. He’s lined up a concert in Chicago, where he’ll join an orchestra on stage for the first time since his career-stalling meltdown. As if the stakes weren’t high enough, Tom has also agreed to use the beloved grand piano of his deceased mentor, an instrument almost as revered as its owner. “If you’re going to play music this dense, you’re going to hit a wrong note,” insists the conductor (Don McManus), in an attempt to ease the frayed nerves of his star player. What neither man knows, but Tom will soon discover, is that hitting a wrong note this time could cost him more than his reputation: Lurking somewhere in the shadows of the balcony is a mysterious sniper, his demand for perfection scrawled onto Tom’s note sheet, his crosshairs locked on the musician’s temple. If Tom makes a mistake, he loses his head. If he tries to call for help, his movie-star wife (Kerry Bishé) loses hers. It gives a whole new meaning to the expression stage fright. Beginning as it does with extreme close-ups of gears and pedals, gleaming like Freddy Krueger’s blades, Grand Piano transports a lowbrow genre scenario to a highbrow venue. At a glance, it looks like a purely visual showpiece: The camera glides fluidly around the concert hall, circling Wood like a predator and rising from the orchestra seats to the balcony in one unbroken take. Yet for all its virtuosic showboating, the film belongs as much to its screenwriter, Damien Chazelle, as it does to its director, Eugenio Mira. Like Chazelle’s terrific Whiplash, which won the Grand Jury prize at Sundance this year, Grand Piano fixates on the extreme measures one person takes to drive a young musician to perfection. 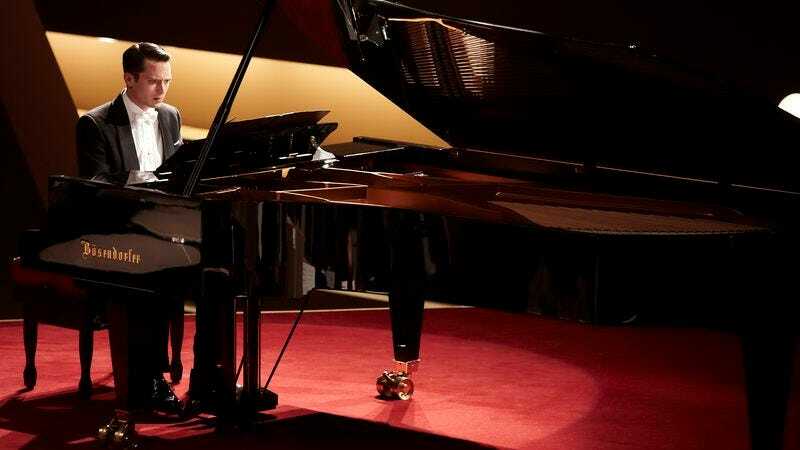 Chazelle, who has a background in music, understands the challenges—the intense competitiveness, the sheer physical demands—of playing classical compositions for a living. In Grand Piano, he simply laces those obstacles with an element of real danger, constructing a pulpy thriller around the pressures of the job. There is, in other words, an undercurrent of emotional truth to this otherwise ludicrous potboiler, which doesn’t quite transcend the goofiness of its premise. The villain is played—or simply voiced, at least for a while—by John Cusack, cooing sociopathic taunts at his victim through an earpiece. (On Tom’s wife, sitting in the box: “I think she’s bored. This really isn’t her kind of music, is it? Does that upset you?”) His scheme, too, is pretty laughable, in both its unlikely logistics and in the surprisingly banal motives driving it. Wood, however, commits fully to the stress of his character’s predicament, giving voice to Chazelle’s portrait of classical musicianship as a crucible of insane expectations. Mira, for his part, just gets his Brian De Palma on, most notably during a split-screen sequence that puts the harried hero on one side of the frame and a brutal murder on the other. Together, these three create a symphony of high anxiety, striking enough right notes to compensate for the wrong ones.